Gain expert insights and actionable tips on a wide range of topics in inbound and outbound B2B lead generation for both new and seasoned marketers. Learn how we planned, executed, and refined this managed IT firm’s campaigns in this short video. This Atlanta, GA-based managed IT company has been a Callbox client for several years now. Callbox has been helping the company grow the Client’s market share throughout the Atlanta area as well as allowing the company to expand in key Australian locations. In one of the Client’s appointment setting campaigns, the company was able to win new managed IT contracts totaling $150,000 from the sales meetings delivered by Callbox. The Client thinks Callbox’s integrated and highly-targeted approach at sales appointment setting contributed a lot to the strong results they’ve seen so far. The marketing industry has a new buzzword – flipped sales funnel or account-based marketing (ABM) sales funnel. The concept gained more traction during a marketing event in Atlanta. What is this flipped ABM sales funnel and how different is it from the traditional sales funnel? In the awareness stage, prospects notice a pain point and want to find out more about it. It is important to take the necessary steps to ensure that your brand is visible and can be picked up on a potential customer’s radar. Putting out content that answers common questions asked by prospects in the awareness stage is one way of attracting them. Prospects have narrowed the problem down and are learning about possible solutions. Prospects will also begin to check out the products/solutions of possible vendors(including your company), and they compare which one fits their needs best. Prospects have chosen a solution and are comparing potential vendors. The final stage when your target becomes a buyer. The flipped ABM sales funnel works similarly, but the focus is different. If in the traditional sales funnel you focus on prospects and try to qualify them, the flipped sales funnel encourages marketers to focus on the company’s decision maker within an account and engage them, so they become your brand advocates. Just like the traditional sales funnel, the flipped ABM sales funnel also has four stages – identify, expand, engage, convert. As mentioned earlier in the article, this kind of funnel focuses on several decision makers in your target accounts. In other words, you have to identify and profile multiple points of contact. First, determine how many accounts match your ideal account profile (IAP). An IAP is a company that perfectly fits your solution. Then, identify who the decision makers are and the role they play in the purchase process. This visual guide goes over the process of selecting and profiling high-value accounts. Once you created the dream company (account) you have for your solution, you need to expand by adding more contacts to it. The contacts are the people who will use the products and service you have. It is indeed the exact opposite of the traditional sales funnel where you have to start outside (qualifying the leads) and inside (create the account). More so, the flipped sales funnel shortens the process because you start with the key person. Engagement is the primary step in traditional marketing to make your prospect aware of your brand; however, it comes third in the flipped sales funnel. Like in traditional marketing, you have to utilize all the marketing channels at your disposal to engage your prospect. At this point, you already know who your key target contacts are; thus, you can personalize your campaign and target their needs, pain points, and motivations more specifically. And that gives you a better chance of winning them to your side. Nurture and follow up each interested decision maker in order to move them into later stages of the sales process. Make sure to leverage marketing automation to deliver personalized messages in context. Giving your customer a tailor-made experience as they journey through the sales process makes the journey enjoyable. Moreover, the personalized service makes them feel important. Consequently, a happy customer will tell others about their experience with you, making them an advocate of your brand. The principle presented in the flipped sales funnel is perfect; however, there’s not a lot of evidence that can prove that it works perfectly and brings more results than the traditional sales funnel. But that doesn’t mean we will scratch the idea. No one should be more open to new ideas and strategies than marketers. Joseph Jaffe, one of the speakers in that event, has a better suggestion – integrate the traditional and flipped sales funnel together. Jaffe, as if by a stroke of fate, wrote a book a few years earlier with the same title – Flip the Funnel. Although it’s not exactly as the flipped sales funnel, the idea he presented in his book is similar. In his book, he mentioned about creating new advocates but using a few resources. Instead, the majority of spending should focus more on retaining your current customers. In so doing, you are building your customers to become raging fans. And we all know how passionate fans are, especially if you can capture their hearts and minds. They become your advocates, your brand evangelists – look at how Apple fanboys and fangirls. There’s no doubt that cloud business intelligence (BI) software presents a lot of benefits to businesses and organizations. It helps companies respond to market changes and improve their business strategies because it gives them access to real-time data. Most of all, it comes with fewer capital expenses helping businesses save more. Despite all the benefits cloud BI and analytics solutions offer, most tech experts agree that selling or marketing these solutions to corporate executives and other end users is still a great challenge. Although some companies are already adopting cloud business and analytics, there is still a significant percentage who either do not want it or have doubts about it. The primary reasons for such hesitation are security and privacy. Then, there’s also the issue around the loss of control. How do you get past these challenges and convince organizations that the benefits outweigh the risks? How would you approach software lead generation for your cloud BI and analytics solutions? In an interview about cloud BI trends, Howard Dresner, Founder, President and Chief Research Officer at Dresner Advisory Services, said that the most reluctant people about the cloud BI adoption are the IT guys. Their concerns are not unfounded since they are the ones who take care of large, enterprise-scale projects in the company. When someone suddenly finds themselves not managing the system, concerns around privacy, security, and loss of control get bigger. Your best bet is engaging an executive — ideally the CMO or CFO — who sees the bigger picture of the company’s goals and strategy. Someone who also has the expertise to translate and focus the company’s mission into KPIs. The following visual guide demonstrates the 3 C’s of selling to the C-Suite, you might want to check it out. If you want to succeed in selling cloud BI solutions (or software lead generation in general), you need to involve every key person and their business areas in the process. By doing so, you will be able to touch the different kinds of BI users in the company as well as create a customized solution for each of them. By determining who the users are and the type of information needed, you can guide them into a buying decision. It’s common for cloud software companies to rely heavily on inbound channels for their software lead generation efforts. In an ideal setting, the potential customer signs up for a trial, sees the value in the product, and then proceeds to upgrade to a paid tier. However, for complex SaaS solutions such as cloud BI and analytics, this sales model doesn’t work most of the time. We’ve heard the phrase “consult, don’t sell” and this is true in every sense. Consultation plays a big role in software selling which means sales meetings drive software sales. And when we say sales meetings, one thing comes into mind – outbound appointment setting. 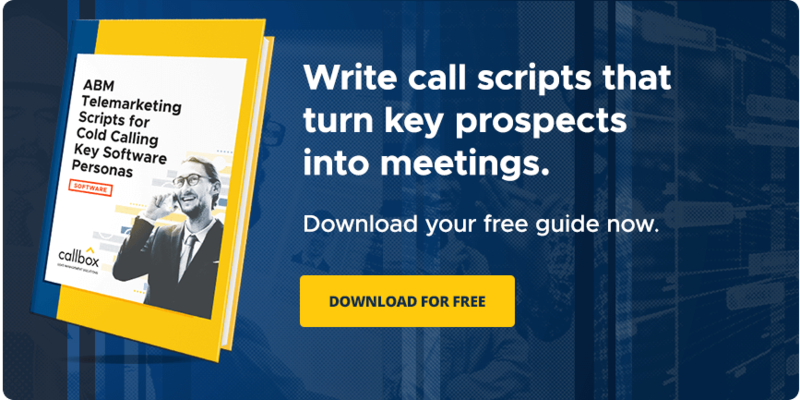 In a previous topic, my colleague, Rebecca went over 4 steps in appointment setting to boost sales meetings with prospects. Outbound channels such as personalized email send outs, phone sales calls, and SMM will allow cloud BI solutions to reach wider audiences, engage the right software buyers, and shorten the already lengthy tech buying process. In short, leveraging targeted outbound software lead generation strategies can fill the gaps of inbound. Employing the services of a lead generation services company (in USA) is common across B2B firms, especially with IT and software companies. With the demands and complexities of modern B2B marketing, it makes more business sense to outsource marketing or at the least, the top of the funnel lead gen activities to an agency. Software lead generation requires planning and a more granular approach. In fact, 60% percent of process is spent on preparation rather than the actual execution. Software companies might be able to replicate the infrastructure of a lead gen services company if they choose to go the DIY route, but the pros of outsourcing outweighs the cons that surface when keeping it in-house. What’s working — it’s not practical to remove an effective and efficient process. How do you integrate these processes into the new strategy? What are the current data sources of the company? Putting those points into consideration will give you an insight into how your BI solution can seamlessly fit into the company’s business strategy. Consumers always consider cost in contrast with value, functionality, and deployment timing. Any product or service that offers value to the consumer and leads them to a better ROI will always win against its competition. We’ve had our share of healthcare lead generation campaigns – ranging from health insurance providers to medical software solutions. We’ve also covered a range of topics about healthcare lead generation like marketing automation, B2B healthcare marketing trends, and even ways to remedy the pains of modern B2B healthcare marketing. But despite all of these, we’ve not yet fully explored the one ever-growing space of the healthcare world – healthcare IT, specifically, lead generation for healthcare IT. In many ways, healthcare IT lead generation is simply IT/Software lead generation except that extra care must be given to the following 2 important steps. Without a competent account selection plan, the other lead generation components (like outbound outreach strategy, content plan, etc.) simply won’t work. For today’s post, we’ll first take a look at the account selection procedure and then we’ll go over 6 healthcare IT lead generation strategies that can help you land more medical sales leads. Unlike the old ways of B2B lead generation, account-based marketing prioritizes high-value company accounts rather than individuals to identify, reach and nurture sales leads. As to how this approach impacts healthcare IT lead generation, ABM allows healthcare IT solutions providers to engage multiple key stakeholders within their target accounts which is essential in today’s B2B healthcare marketing. Map out the relationship between the key decision makers – It’s not enough to identify who the decision makers are and what role they play in a target account’s purchase process. You also need to determine how each stakeholder relates to the other buyers. The following visual guide maps out the key ideas behind account selection, so that you can develop and refine your account selection approach. 1. Use the internet to highlight your area of expertise. The internet is your playground. You have the potential of reaching the right people in a short period of time for lesser the cost – that is if you plan well. This is the advantage of using its vast reach and astounding speed. You can get the job done without breaking a sweat. Position your business as an authority when it comes to healthcare IT. You may add helpful blog entries in your website that will require the readers to encode their names and email addresses before being directed to the actual article. As a start, you can check the Top B2B Lead Generation Companies in the USA and choose the right lead generation agency that meets your healthcare IT lead gen requirements. There are several platforms available online that can help you generate the kind of leads you are targeting. Consider creating a presence on social media platforms such as Facebook, Twitter, Instagram, and Pinterest to mention a few. Of course, getting the attention or catching the interest of your target is all about creating killer content. There is a lot of attractive content made available on different platforms every single day. However, not all of them are able to achieve the results that they want. And the reason why they did not meet their goal is something that you should avoid. It is important that you study your target market and identify what kind of content catches their attention. It would surprise you to know that, oftentimes, the content that has lesser frills and has a simple message is the one that attracts most people. It doesn’t end with content though, by leveraging the reach of multiple marketing channels, you can bring your offer to right prospects at the right time. Email – you can’t go wrong with emails. 79% of B2B marketers rank email as the most effective distribution channel for demand generation. Phone – telemarketing (if done correctly) can give you outstanding results. From cold calling, to customer profiling and lead nurturing, phone-based sales calls can shorten the already long sales cycle of healthcare IT selling. Social Media – How you use social media depends on your overall lead generation objective – some use it to drive revenues while others simply for branding. Take your email marketing to the next level using our 40 B2B Email Templates for every situation. Generate Healthcare IT leads and appointments – grab our FREE sample appointment setting scripts for all industry types. Nowadays, people respond easily to content that is catchy. When there is a reward involved, people get excited all the more. If you decide to do a contest of sorts, make it part of the process for those who will join to enter their contact details before they are directed to the other details of the competition. Create content that is worth their while. Healthcare is primarily for the people, and for healthcare IT, despite being B2B-focused, appealing to people’s excitement helps create the brand culture that attracts customers. Since you are considered an authority in your area of expertise, you can come up with short webinars to help business operators understand healthcare IT solutions better and how the product can help their business. You may also expound on the many benefits that a business can experience from a unified system. Require interested individuals to enter their contact details before they get access to the webinar video. Make sure that your webinar video is engaging, casual and comprehensible. This is the only way you can make sure that people will keep coming back for your content. Getting referrals is one of the easiest and fastest ways to get new leads. This is only possible, however, if you have a solution that is tested and proven. Your healthcare IT solution should be well-recommended as well. Those who have tried it on their businesses can make these recommendations for you. It also pays to go back to previous referrals and touch base with them. Even if they did not purchase your product in the past, it doesn’t mean they won’t have a need for it in the future. So, go ahead and reconnect with them and ask about how their business is doing. You can also introduce the idea that you have new software solutions they might want to check out as it is helping other businesses as well. Appointment setting is an integral part of any lead generation or sales prospecting process and as a business development executive, I am aware of how sales and marketing work toward this goal because it leads them to the primary objective – customer acquisition. In other words, a sale will not happen unless you get to meet and talk to prospects. Looks like a simple process yet a lot of salespeople struggle with sales appointment setting. A lot of businesses spend a huge chunk of their time and resources on finding ways to grab prospects attention and securing meetings with these decision makers. Research shows that 75 percent of the total sales effort goes towards this process. Definitely a HUGE chunk! We also experienced the same predicament during our early years. After a series of strategizing, trial and error, and going back to the board, it all boils down to these two – structure and clear goals. Once the team created a structure, creating a SMART (specific, measurable, attainable, realistic, timely) goal becomes easier. Getting prospects without identifying them first is like a boxer fighting his own shadow. You try to beat an enemy that doesn’t exist. The same applies to business – how can you know if the prospect you’re trying to run after is the right fit for you? Or how can you know that what you’re offering will address their pain point? When our team finally identified and profiled the kind of clients we want to do business with, we saved ourselves not only of time, money, and effort. We saved ourselves from unneeded stress because we know what we’re after. If a certain company or client does not fit your ideal customer profile, move on to the next one. The key is to focus on high-value accounts by identifying target companies with the highest potential of turning into your customers. After identifying your ideal customers, you need to gain in-depth understanding of each target account by building complete profiles of the individuals involved in the decision-making process. After all, the goal of appointment setting is to secure meetings with the right potential customers. By doing so, you know the people you need to persuade and engage so they will take action. These individuals might include C-Suite such as CFOs, CIOs, and CMOs and/or upper management decision makers. This resource goes into detail on how you can refine your executive sales pitch using the three C’s of selling to the C-suite. You can also tailor your approach to each key individual in the company. Remember that your primary goal is to connect the pain points of each person in the buying committee back to their company’s objective so they will reach a consensus to make a purchase decision. The importance of this step in every lead generation and appointment setting campaign is pretty self-explanatory but there are a few modifications that can help you get better results. An effective approach to multi-channel marketing is to choose the channels your key prospects tend to use more often, and then tailor your outreach and appointment setting touchpoints based on their activities across these channels. Knowing how frequent they use these channels is next to impossible but you can make an approximation using the information you’ve gathered in the first 2 steps. EMAIL – deliver timely and personalized emails to warm up and nurture prospects. Create email templates for different touch points in the campaign – from initial outreach, all the way to targeted send-outs. PHONE – nurture, qualify and book sales meetings with potential leads using 1:1 phone outreach. Phone-based touchpoints boosts performance by delivering leads at scale and producing results in real-time. SOCIAL – social reinforces the touches made in other channels and enhances your campaign’s online visibility. Focus on three key social media deliverables: impressions, connections, and actions. WEB – use lead-generating landing pages that maximize your sales appointments and conversions. The landing page serves as the campaign hub where your target prospects can learn more about your offer, access downloadable resources, and submit additional information. Now that you have identified and profiled your target accounts and individuals, it’s time to create customized campaigns that resonate with them. Start aligning your message with the needs, interests, and challenges of each key person in the account. Ideally, the message you develop should have a unique value proposition that will influence each key person towards a buying decision. Understand what each key person believes in and meet them where they are. Develop a clear and strong case for your position. It sends a message that you know what you’re talking about and eventually, the solution to their pain points. You can further strengthen your case by using real-world examples to show that your ideas indeed work. Finally, you need to measure the results of your appointment setting campaign. Measuring the results also include tracking account engagement, calculating the opportunities that have been created as well as the deals you’ve closed and their value. Results take time, so give your team time to create results. Keep on evaluating so you can adjust your appointment setting tactics and strategy if needed. How do you generate leads for IoT solutions? Let’s get down to IoT (we meant “it” – pun intended) and show how you can generate leads for your Internet of Things solutions. Read on, we won’t let you down! 1. Brainstorm with influential individuals in your network. Most of the time the best promising leads can be generated from your close circle of acquaintances and friends in the software industry. Of course, these should be people you trust and trust you in return. Gather information about big players in the market who would most likely be in search of IoT solutions. This process may eventually pave the way for a possible partnership – this will make your job a little bit easier as you have another group helping out in convincing targets to consider your IoT solution. Partnering with another business will give you access to existing clients from the other party. They may already have leads that you do not and marrying your efforts get the job done faster. Lead generation for IoT solutions through networking, how does it work? Events and tradeshows offer excellent opportunities for you to rub elbows not only with potential IoT customers but with your next brand advocates as well. If you don’t have any IoT events lined up at this time, one good place to start would be the upcoming IoT Asia 2019 expo happening on March 27-28 in Singapore. IoT Asia 2019 will also be followed by Callbox’s Sales Prospecting Masterclass for ICT on March 29, so you might want to check that out, too. The free workshop is going to help you gain solid strategies to convert tech prospects into customers, as well as provide you with more opportunities to network with other marketing leaders in Singapore’s ICT industry. An average of 7 to 20 people is involved in today’s B2B buying process which means a longer sales cycle. Contrary to what you’d expect, having multiple stakeholders involved is not a setback but a very welcome development in today’s B2B lead generation. Instead of focusing on a selected few prospects who may or may not influence the buying decision for your IoT offer, you can connect to as many stakeholders as necessary within your target company accounts. By building relationships across the company, you’re setting the stage for your brand to reach your target decision makers. Talking to multiple contacts gives you more opportunities for a referral or introduction to the right person in the organization. That’s basically how you’ll get in front of higher-level prospects. Where can you find a good B2B lead list for IoT solutions? We go against list buying as it does not guarantee the quality of the leads you get. A preferred option is to employ the services of a lead generation firm to help you build the right lead list using proper customer profiling methods such as phone verification, data cleansing/scrubbing, deduplication, and database management. LinkedIn is a very practical approach in order to find the right people. You simply have to check out which company they belong to. You may also consider using keywords that suit your lead generation requirements. Additionally, this resource goes in-depth on how to build and profile the right B2B lead list for your lead generation campaign. An IoT solution is very crucial in initiatives intending to create smart cities all over the globe that can manage and regulate basic utilities such as garbage collection, water supply management, and energy supply management. Connecting various tools and devices through the internet makes the task of running things a lot easier and more efficient. Ordinary individuals do mobile banking as easily as they turn on their stoves in order to cook a meal nowadays. We pay our bills online, send and receive money without leaving the confines of our homes, shop online while we are in our PJs, and even invest in stock exchange with ease. These are made possible because of a complex yet connected network of tools and devices that your business is able to provide. Groundbreaking initiatives have been accomplished because of the revolutionizing benefits of IoT. Medical practitioners are able to monitor the progress of their patients remotely through this technology. Heart monitors and insulin pumps are two examples of tools that have become easy to manage through this solution. A few years from now, our generation will go beyond cars on autopilot or self-drive modes. Smart cars are clearly a product of IoT solutions that really work. The transportation industry will always be looking for new ways to level up the functions of new cars and it will only get better and better. The way products reach customers has greatly improved in this generation. The process has become faster and more efficient with a lot of help from the Internet. Consumers are able to easily track their items and manufacturers can rely on a software program that gets their products out effectively. With B2B marketing’s ever-increasing complexity, IT and software companies are now shifting towards technical B2B marketing approaches such as account-based marketing, influencer marketing, multi-channel touch points, advocacy programs, etc. This adoption exposes a common gap among B2B tech companies – the shortage of marketing talent, the need for fresh or unbiased perspective and lack of technology needed to fulfill these activities’ demands. Outsourcing part or all of marketing to a lead generation firm allows IoT solutions providers to scale their lead generation efficiently. IoT companies can take advantage of the skills and expertise needed to achieve their sales prospecting goals. Plus they get supplementary expertise such as project management which is highly needed in today’s lead generation projects. You can never go wrong with referrals. It becomes a lot easier to conduct business when you have the endorsement of a trusted friend. Moreover, target clients are more open to the idea of listening to you because you were connected by a familiar person. Trust is key. You may also want to consider reconnecting with old referrals. Some may have declined your product in the past, but they may have a need for it now. Who knows? There is no harm in trying. 6. Consistently do customer care calls. After sales care is often a neglected stage in the sales process. We have done the hard part which is to sell the product, we can now move on. Unknown to many, a solid percentage of businesses are highly likely to make another purchase in the future when they realize that your company cares for them. Go ahead and check on your clients and ask them how the product is helping their business. You may also want to get valuable feedback such as additional features you can add in the future in order to improve the product. All businesses, big or small, depend on leads to find potential clients fast. Lead generation is defined as the process of finding people who are most likely to do business with you now or in the future. To consider them as leads, you must get their names, email addresses, or their company name so that it will be easy to establish a business relationship. You could have started playing several roles in your new business, and one of them is lead generation. You meet people, ask friends to give you referrals, even buy leads. As the company grows, so does the need for more people. But, will scaling up your in-house lead generation team benefit your business? Or will outsourcing be a better option? Having an in-house team of lead generators may appear economic, outsourcing is still an attractive choice for those who want to save time, effort, and money without compromising the growth of their business for the following reasons. The company does not have to create a new unit. Forming an in-house lead generation team could mean hiring new people, providing a workspace for them, and processing other documents related to their employment. When you outsource, you do not have to do these at all. You get expert people to work for you. Outsourcing agencies only employ people that are highly-qualified. They train them to increase their efficiency and to upgrade their knowledge and skills in using the latest tools and technology. The company does not have to hold meetings and push the team. The agency from where they are outsourced takes the responsibility to deliver the kind of service that they promised. You can expect timely completion of tasks. When you outsource, there is always the time frame or deadline. Results must be delivered within the time frame, and so, you get immediate and positive results. What marketing activities should you outsource? PPC Campaigns – PPC can be very challenging, especially if you lack the needed background in search engine marketing. SEO – Not all companies can master the rapidly-evolving art and science of SEO, so it should be left to outside specialists if you don’t have the expertise internally. Social Media Marketing – While automation can help, social media marketing can still take up time and resources if carried out in-house. Event Marketing – When an outside lead generation provider takes care of the promotion and marketing of your event, you get to focus on what really matters: results. While companies can benefit from a co-sourcing model – blending external lead generation firm with the in-house team, making sure that they can work together smoothly will maximize the benefits that you can reap. The outsourced lead generation firm must share information that can help improve company sales. You can set up teleconferencing once a month so that your in-house team is aware of the activities of the external team. Your lead generation outsourcing partner can identify the challenges that the in-house team members encounter so that they can help them find solutions. When a company outsources some tasks, the company employees that do the job may think that you find them inadequate. It is essential to make sure that the agency you hired can provide the support that they need to achieve useful results. Your in-house team is bound to wonder what the outsourced team is doing if they do not get any support from them. Show your external agency and your in-house team how their cooperation has brought success to the company. Find time to celebrate their triumphs and make them aware that this success is the result of their twin efforts. It will inspire the two teams to continue working together to attain company goals. How to choose the right lead generation outsourcing partner? Do they offer the type of lead generation service we need? Will they look after our brand and potential customers with same quality of care as ourselves? What do former and current clients say about them? How familiar are they with my industry? Most companies do not have a team that focuses on lead generation alone. Members of the sales and marketing teams would perform the task when there is an opportunity or when it is deemed necessary. They get leads when attending seminars, webinars, business conferences, and trade fairs. They get names and email addresses but fail to find out if these persons will be interested in their company’s business. It results in getting useless leads. Companies that offer lead generation services specialize in this undertaking. They are experts in using all lead generation tools, strategies, and technologies. They are expected to bring the results as promised, and they have to do everything they can to deliver what was promised to their clients. Outsourced lead generation will not succeed if it is not integrated into a company’s current system. Taking steps to enable the external lead generation firm and the in-house team to collaborate will bring the best results. There are plenty of mistakes that can happen when you market your software product and to avoid these unnecessary mishaps certain precautions must be taken. From core competencies to poor timing, there are definitely a lot of things to watch out for. It is a natural default for potential buyers to compare and contrast specifications most especially when it entails entrusting their business processes to the effectiveness of the software tool being offered. When marketing your software product, be prepared to counter or give additional details about what you are selling and how it stands out from the competitor mentioned. Do this professionally. Avoid bad mouthing the features being offered by your competitors. Instead, highlight what makes your product worth investing in and offer to add specific features that will address their needs. If you want to dominate the market, make sure to do things right from the start. This means establishing a team of specialists in your industry who can give you a better understanding of the process from end-to-end and the right guidance at the same time. Working together with a software marketing specialist/firm allows you to cut your total marketing spend or get better output (e.g. : more qualified leads, higher conversion, and faster sales turnout) with the same budget. How to identify the right software lead generation firm? Spending so much of your resources marketing to the wrong set of potential buyers is an awful waste of your precious time. Some potential buyers seem promising in the beginning because they will respond to the way you engage them. Unknown to you, they will easily drop your proposal after spending so much time expounding on your product. Remember that the right people will always translate into actual sales. Finding the right people for your software product is only possible by first identifying businesses who are highly likely going to need your software product. Identify the buyer personas who can be expected to respond well to your marketing initiatives. A buyer persona, while semi-fictional in essence, represents the kind of buyers you should be targeting. Common data that would be accessible to you include demographics, buying behavior, goals, and motivations. How can software companies find the right software leads & buyers? Account-based marketing lets you engage multiple contacts/prospects within a target company using messages tailored to each contact’s role. By connecting with different company contacts, you can improve your brand’s chances of reaching the right decision maker. Sure, word of mouth can work for some products. Unfortunately, not as well as you may hope for a software product such as the one you are trying to sell. A person who says he likes your software better than that of your competitor will not create a snowball effect. If you want word of mouth to work beautifully for you as a marketing initiative, you have to get the information out to as many people as possible in order to start an effective trend. These people need to be convinced that your software product works and that it addresses a very important need. Positioning your product as a solution will really do wonders for your business. How can ABM drive brand advocacy? We now know that through ABM, you can bring your offer to multiple stakeholders. But by pairing ABM with multi-channel marketing, your touchpoints are in context, resulting in a better overall experience which is the foundation of every solid brand advocacy program. If you are unable to summarize the best features of your product in 2-3 sentences, you may have to sit down with your team again to come up with this. Avoid giving too much information that has the potential to confuse or over educate your target clients. It tends to complicate their decision making when they have too many information they need to sift through and understand at the same time. In business, timing is everything. Study what is the best time to launch your marketing campaign, make a sales call or send out sales emails. You wouldn’t want to be caught in the middle of a tight season when your target clients are spending on other important expenses and would most likely reject your sales pitch. With the right marketing automation platform, you can deliver relevant personalized messages across channels. A lot of potential buyers get turned off by complicated buying processes. The simpler the process, the better for a lot of business owners. For instance, there are vendors whose call-to-action is unclear or too complex to comprehend. When buyers encounter this kind of complication, they tend to have second thoughts and this may result in a lost sales opportunity. Make sure that your product is easy to purchase. Helping software businesses for 14 years. Learn how we generate B2B software leads. List building or contacts profiling is the process of pre-qualifying your prospects and contacts in order to collect and prepare all the relevant information needed for your lead generation campaign. It helps you save precious time and energy in driving your sales and marketing operations, and ensures that your lead generation campaigns are effective. You would often start with the most basic task of all – collecting vital information that will help you and your team make better classifications of targets. While seemingly elementary, at Callbox, we find this step to be crucial and highly helpful in narrowing down the B2B leads list as lead generation campaigns progress. This would include a list of cities and their zip codes, regions and countries where the campaign will be potentially launched. Your campaign’s success is dependent on whether you decide to expand or narrow down your geographical reach. Expanding or narrowing down this parameter mostly boils down to what you’re trying to achieve for the campaign. We usually include Standard Industrial Classification (SIC) codes which is a system used to classify various industries in four-digit codes. It is widely used in the United States and the United Kingdom. We find SIC codes very helpful as it helps us organize prospects systematically. Additionally, we also use common keywords (e.g: technology companies, financial firms, etc.) that define or classify certain industry groups. In every marketing campaign(lead generation, sales prospecting, event marketing), it is imperative that you identify the key people and influencers in your target accounts’ org chart. Who are the key people that impact the purchase decision for your offer? Identifying multiple contacts allows you to address different concerns and objections from different stakeholders within a company. Depending on your offer, this parameter could be optional. Most companies find it necessary to estimate beforehand how much an organization is willing to spend for a solution or a product. This parameter does not tell it all, but it can provide a good indication on who you would want to prioritize for your campaign – contacts from organizations that offer the highest revenue potential for your business. Having gathered all the helpful data needed, you can move on to evaluating the target specs you have collected and assess whether certain groups are doable or not. This also means that you need to be able to remove from the list certain targets who may not necessarily benefit from the product or may not need it after all. At Callbox, this is the part where we also finalize the target criteria and we usually end up either expanding or altering the list as we go along. In the end, you need to be able to come up with a list of targets promising enough to take a business to the next level. At this point, you would have narrowed down your list to the top choices. By saying this I mean that you have thoroughly weighed the outcome and those whose names appear on the list will contribute to the success of the marketing or sales campaign. There are several ways to score your B2B leads list. You can rank prospects based on profile completeness, the value of certain attributes (position, social media followers, etc. ), or a combination of demographic and activities – the latter is usually determined during the campaign. At Callbox, before launching a campaign, we aim for a list score of 50% and above – using a combination of information completeness and the perceived value of each lead to the client. Having a lead scoring system more or less guarantees that your team will have access to vital information about the targets listed. Checking and checking again is key. Based on our experience, there is always something to add, something amiss, something that needs to be expanded or removed. This step may sometimes make you feel like you are right back where you started, but that it is better rather than become overconfident and miss out on other important details. A common practice is to compare data from your B2B leads list to old existing data (if available). Comparing gathered data allows you to make corrections if there be a need for any. The following video goes over the 5 F’s of data hygiene best practices for richer data-driven campaigns. Along the way, I also often come across additional data that is good as back up. Having 2 potential contacts listed is way better than just having one. It gives you a Plan B should the first contact be inaccessible. By connecting with different company contacts, you can improve your brand’s chances of getting picked up on a potential customer’s radar. At the end of the day, it is important to get third-party insights from people within your team. The success of your B2B leads list building process also greatly depends on how well we marry our ideas, beliefs and business intuition. One very crucial requirement in compiling marketing databases is that the lists need to be fully compliant with applicable data privacy laws and regulations. We’re handling data after all, and it’s always good practice to manage data ethically and responsibly. That’s why it’s important to take extra measures throughout each step in the list-building process to ensure full compliance with requirements outlined in laws such as GDPR, the CAN-SPAM Act, PDPA, and others. Aside from the well-known IT giants, most IT companies and startups are small. However, the pressure to increase their sales and marketing effectiveness, or keep them ahead over their competitors is real. They have to improvise or fossilize, and part of that is improving their lead generation. How to do effective lead generation for IT companies? Generating qualified IT leads and nurturing sales opportunities are accomplished by combining content marketing, relevant data/metrics analysis, lead scoring and validation, and conversion optimization. Moreover, an effective lead generation strategy does not stop there. It continues to innovate and optimize techniques and strategies that yield satisfactory conversions for IT companies. Consumers these days do their own research before they make a purchase decision. They need to know that a certain service or product will solve their pain point or not. IT companies can put themselves out there by adding value for their target audience and addressing their pain points. Content should address how these businesses in the IT service arena can boost their business, reduce expenses, improve their efficiency, and help them innovate. Exactly find out what the business needs through case studies, specialist research, news, and articles. Make technical requirements much easier through product testing, demo, and how-to content. Analyze products and services through product demonstrations and presentations as well as through peer reviews. No matter what niche or industry it is, the most effective lead generation strategy is dynamic, relevant, and data-driven. It is accomplished through monthly goal setting based on website traffic, prospects, leads, and customer acquisition. Lead generation should be consistent, always improving and innovating. Always analyze your conversion rates from various inbound marketing sources so you can pinpoint what fits your business best at the least cost possible. Use the data you get from these places so you can achieve your goals better and improve your results. The most effective way to gauge the level of your target audience’s interest is through evaluation of their behavior on your site and their interaction with your other demand generation strategies. You can further qualify leads better for your sales team if you score them based on their progress through the customer journey funnel. Automating your marketing processes will help you effectively gather data from your users and their activity. It will also help you automatically attach a value to each new lead you have. Moreover, automation can easily help you identify those who are ready to buy. It also helps your marketing team trigger workflows and sends appropriate communications based on your leads’ activities, behavior, and interests. Lesson 3 of our 6-part free lead management email course goes into detail on how to score and rank your leads. Users are always expecting a positive experience every time they interact with your site or brand. After all, they are looking for convenient and effective solutions. These are conversion opportunities that, when addressed properly, will improve your conversion rates. With this in mind, you have to deliberately make an effort to create your landing pages, website, and content engaging, impactful, and inspiring for your prospects. Most of the time, users use their mobile devices to access sites and will make a quick scan of it. You can improve lead capture by creating well-designed landing pages, call-to-actions, and forms. Make your forms quick and painless to increase your conversions. You should focus more on accessibility and convenience rather than novelty. Consistency is the word when it comes to lead generation. Whether you are in the IT sector or any other industry, all lead generation efforts will go down the drain if they are not consistent. That, coupled with the suggestions we gave you in this article, can help you bring your lead generation efforts to the next level. Looking for the best lead gen provider for IT managed services company? Learn Callbox’s lead gen process in generating managed IT leads. You can get almost any kind of information on the Internet — from the most useless trivia to building a house. For this reason, a lot of people embark on DIY projects although the results are not always positive. Companies, too, are jumping into the DIY route especially when it comes to lead generation, thinking they can save more when they do. However, not all DIY projects ended happily and satisfactorily. You can see memes of DIY disasters all over the Internet. Who could miss the “expectation vs. reality” GIFs? The significant and long-lasting impact of your lead generation efforts takes time. It will require you to invest a great deal of your time and effort before you see any tangible results. In the same way, DIY lead generation will take the same amount of time and effort or even more. If you don’t have a lead gen team, you might soon see that you are spreading yourself or your staff (whoever is assigned to) too thinly. You might even get distracted away from the main core of your business. Sometimes, you might be able to meet the rigors of a lead gen campaign at the beginning but have difficulty following up since it will require a great deal of attention. Moreover, lead generation campaigns need a significant amount of learning curve that will consume more time before you can apply them practically. Your business might be using a variety of technologies and platforms that have different functions. How many marketing-specific tools does your company use? Here’s the question, though — how many marketing-specific programs does your company use? The answer varies on the size of your business but if you are a small business, the answer is most probably very few or none at all. If you are already struggling with your tools, how can you expect your lead gen campaign to be successful? One, experts and specialists are in charge. These don’t have just the skills, but they have years of experience. In other words, they don’t rely on guesswork but data and analytics. Two, they have the tools and cutting-edge technologies sparing you from investing hundreds or even thousands of dollars on additional tools and software. If your business is experiencing growth, you will need more people. The hiring process can impede your growth because you need time looking for the right person to handle the additional responsibilities. On the other hand, the growing work can overwhelm you, and you could hire the wrong person because of haste. If you have managed lead gen, however, you can add qualified experts within a short span. They can easily integrate with your company flow with little or no supervision needed. It saves you money from training new staff and needless errors. Because consumers are different and they can change their minds quickly, and also because strategies need to evolve, you can’t be stagnant with your lead generation campaign. You need to bring it to the next level, and that’s where the pipeline strategy comes in. Pipeline strategy analyzes marketing and sales data, so your goals and decisions are based on revenue. A reputable lead generation service is well-qualified to use this strategy to keep your sales up and generate revenue for your business. More so, these experts have the flexibility to adjust according to the changes in businesses by increasing or decreasing your leads according to your requirements. Why attempt a DIY and place the business you have worked for at high risk when you can have experts and professionals who have the technology and experience that will bring your business to the next level? Talk to one today to enjoy the benefits and stay ahead of your competition!